Federal agents reportedly recorded the messages that American Idol judge Paula Abdul left for Idol wannabe Corey Clark as part of a terrorist sting operation. The agents, who were monitoring Clark's phone calls under a provision of the Patriot Act, were after suspected Jordanian terrorist Buelah Abdul. WASHINGTON, DC—Inquiring minds want to know: exactly how did ABC get the hot-and-heavy voicemail messages left by American Idol judge Paula Abdul for Idol-wannabe Corey Clark? Blame it on the Patriot Act, says a high-ranking US intelligence official who claims that Ms. Abdul was the unintended victim of a sting operation intended to sniff out Jordanian terror suspect Buelah Abdul. 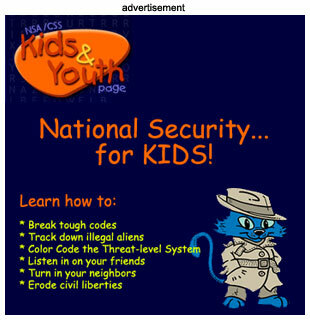 The messages were recorded by federal agents under the Foreign Intelligence Surveillance Act. "I can't give you a lot of details," says the intelligence source. "But I can confirm that Paula Abdul is no longer being investigated as a suspected terrorist, and the voicemail messages that she left for Mr. Clark have been returned to him." The FBI agents who conducted the top-secret investigation apparently confused the Hollywood A-list Abdul with her similarly named counterpart on the US terror list. They reportedly relied on roving wiretaps to monitor the lovebirds' conversations as well as to tape numerous voicemails left by Ms. Abdul for the 22-year-old Clark. Under the Patriot Act, passed in the weeks after September 11, 2001, the federal government may monitor the phone calls of individuals "proximate" to the primary person being tapped, in this case, Ms. Abdul. The intelligence source says that FBI agents believed that they had correctly targeted suspect Buelah Abdul because of the content of the conversations overheard between Ms. Abdul and Mr. Clark. Agents reportedly heard talk of 'silencing the judges,' leading them to believe that Ms. Abdul and the American Idol hopeful planned to target federal judges as part of a terror operations. Suggestions that Mr. Clark 'trim his beard in order to look more mainstream' also raised a red flag, as did references to a person or persons being "the bomb" or "bombing." The suspicious terms and phrases used by the Ms. Abdul and Mr. Clark were automatically picked up by the National Security Agency's ECHELON program, a global surveillance operation that listens for key words used by terror suspects. But when Buelah turned up in Amman, Jordan in February and was detained by police there, the FBI realized that they'd been after the wrong Abdul. Agents reportedly removed the wiretap from Ms. Abdul's phone and inadvertently returned the voicemail messages to Mr. Clark, who then sold them to ABC. A spokesperson for the ACLU quickly condemned the incident, charging that Ms. Abdul was singled out because she is a prominent Arab-American. Ms. Abdul was recently featured in a brochure created by another prominent Arab-American, Casey Kasum, entitled "Arab Americans Making a Difference." "You have to understand that to the Bush Administration all Abduls are the same," says ACLU spokeswoman Lucy Travis. "Paula Abdul epitomizes what's great about this country. She's the star of a show that features amazing talent, where everyone has a fair shot at becoming famous. Isn't that really what America is all about?" What star on 'tap' next? The number of court-authorized wiretaps in the US jumped by 19% in 2004, not counting the 1,754 court orders for terror-related investigations under the Foreign Intelligence Surveillance Act, like the one that entrapped Ms. Abdul. 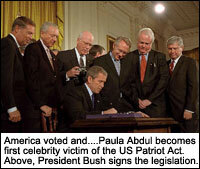 Ms. Abdul is the first star to be snared under the Patriot Act, the federal law that greatly expands the US government's ability to conduct surveillance operations on its citizens. If Paula Abdul had been found to be planning a terrorist operation, would you still watch American Idol? Talk back to [email protected]. corey clark brought this up on Howard Stern today. apparently some people think it's true. Why doesn't anyone appreciate SATIRE anymore? Relax, folks. It's a joke. *laughs head off* Paula, linked to terrisim??? That is thew dumbest thing I've ever herd! How fuckign retarded? I have to admit I did laugh, but c'mon people get a grip? Paula's NOT a foreigner....she was born in California. And to imply that Simon may have terrorist ties just because he's British is the most ridiculous thing I've ever heard. I'm not completely positive on this, but I have it on good authority that she's not the only judge who's a foreigner on that show. Kinda makes you think, eh? The drawings have been altered to protect my identity. And I'm not really colored blue in real life.